It's officially Fall. The rains have started - although this week is beautiful. The trees are turning fall colors. And yet there are new flowers blooming. My yard is full of pale pink coleus, which is what I think these flowers are that Lee Lageschulte found on her walk. I have more photos of fall flowers - watch for them in future editions. 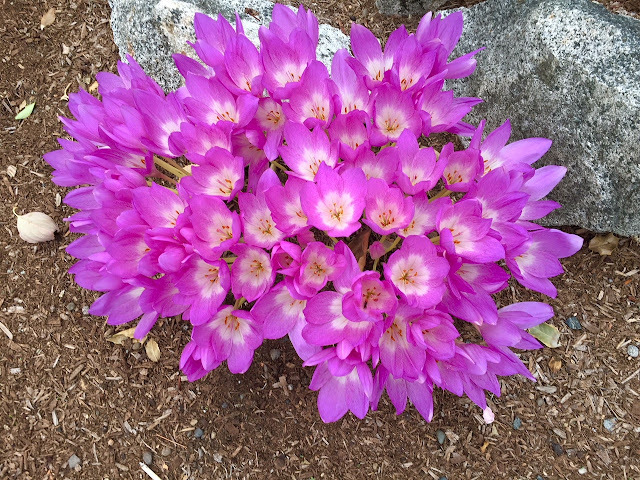 Autumn Crocus (Colchicum Autumnale) which is not a true crocus. It's more closely related to the lily. An unusual color for fall flowers, but perhaps even more beautiful because of it.